As part of an on-going and comprehensive review and update of Alberta’s Licensed Practical Nurses Profession Regulation (LPN Regulation), the College of Licensed Practical Nurses of Alberta (CLPNA) is once again calling on LPNs to provide feedback on the proposed changes to the LPN Regulation. 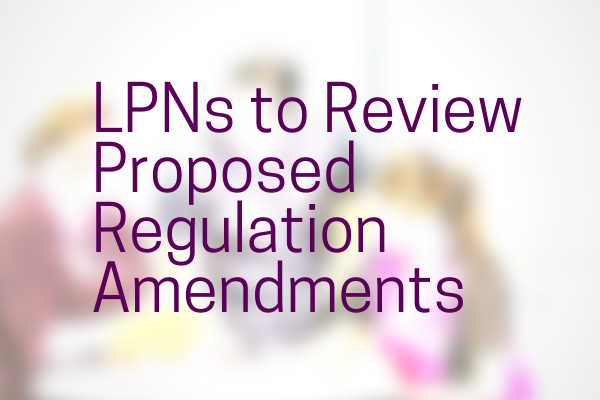 In July 2016, the CLPNA asked LPNs and other partners for feedback on proposed changes to the list of restricted activities in the LPN Regulation. We asked you to provide comments on authorizing LPNs to administer blood and blood products and parenteral nutrition, and add bladder scanning, fetal heart monitoring and dispensing medication as part of the LPN scope of practice. We received many comments, which aided in adjusting our proposed amendments to the restricted activities and the CLPNA continues this important work with government. The CLPNA is now reviewing the remaining sections of the LPN Regulation. It is important to note that this is only one step in a complex process of having the LPN Regulation amended by the Government of Alberta. No timeline has been set for completion of this work and Government has not agreed to make any of these changes yet. Licensed Practical Nurses will be asked to engage in the review and provide feedback in early April 2019 by email.